Supernova Sequence Boost 7. Say that 5 times fast. Longtime readers of this site will remember my review of the original Adidas Boost shoe. Today, thanks to Fleet Feet Davis’ “Big Shoe Off” I had the chance to run in one of Adidas’ newest boost shoes, the Sequence Boost (the rep also said it will be known as the “Adidas Supernova Boost Sequence 7”). Generally you don’t see me running in “support” or “motion control” shoes, but this one was a bit different. Instead of a medial post, they wrapped the boost’s plastic sole control surface up beneath the arch, essentially creating a stability through the midfoot, though just along the inside. Here’s the thing though, running the shoe with a midfoot/forefoot stride meant I never activated that portion of the shoe. 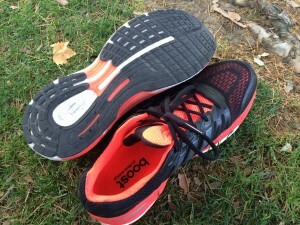 And the boost material is open to the forefoot, resulting in a bouncy, zooming gait. I swapped to a heel strike pattern and immediately felt the shoe corraling me into a “correct” gait (which, for me, is incorrect due to my ankle injury). So the shoe does what Adidas designed it to do for traditional, heel strike runners. The drop was fairly severe, but not so much that I couldn’t run in the shoe. Still, for me, after a while I would tire, get sloppy and then the shoe and I would have words. From my brief encounter with the shoe, I can tell you this. The boost material works as described: it bounces you. 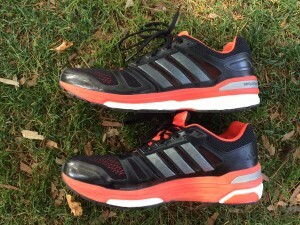 Energy return is huge, for what could have been a very clunky shoe, the Adidas actually felt quite fast. I guessed that the model on my feet was 9oz max. It was actually 10.9, which surprised me as it felt lighter and faster on turnover. Still, I was a bit disappointed, as I’d hoped the shoe would weigh in under 10oz. The upper maintains Adidas’ recent tradition of high quality, comfortable uppers. It was a sweet, soft & comfy fit. Slipper-like? Yeah. Slipper-like. If you’re looking for a traditional shoe, and don’t mind a bit of “help” with your gait, the Sequence is a fine, fine shoe. Get used to Boost, because soon every damn last Adidas on the planet, at least in running, is going to use it. And good, I say. I like the feel of the material. Personally I would prefer something with less drop (gimme a 4mm drop, plate-decoupled boost shoe with the same stack height as this one and I’d be in heaven. “Adidas SuperPanther Boost” anyone?) but there’s plenty of runners out there that will love it. High: Comfortable, bouncy traditional high-drop stability control running shoe. Upper is super nice. Low: Could be a little lighter. Check out reviews of the other shoes I tried out over at my event post of The Big Shoe Off! This entry was posted in Gear Review and tagged Adidas, Boost, running, Sequence, shoe, Supernova by TheFatPanther. Bookmark the permalink.